Handy Tab collects some anonymous information each time you use a Handy Tab Extension so we can improve the overall quality of your online experience. We collect your IP address, referral data, and browser and platform type. You do not have to register with Handy Tab before we can collect this anonymous information. The Handy Tab Extension do not require you to share information that identifies you personally, such as your name or e-mail address, in order for you to use the Handy Tab Extension. The Handy Tab Extension assign an anonymous ID number to your requests and links the following additional data to that number: the date and time you visited the Handy Tab Extension, your search terms, and the links upon which you choose to click. Like most standard Web site servers, we use log files to collect and store this anonymous user information. Handy Tab analyzes the information to examine trends, administer the site, track user's movement in the aggregate, and gather broad demographic information for aggregate use. From time to time, Handy Tab may conduct surveys or contests on a Handy Tab Extension. Participation in these surveys or contests is completely voluntary and you therefore have a choice whether or not to disclose individual user information to the Handy Tab Extension. Contest information will be shared with the contest or survey sponsors to notify the winners and award prizes. Survey information will be used for purposes of monitoring or improving the use and satisfaction of the Handy Tab Extension. We may use an intermediary to conduct these surveys or contests. These companies may use your personal information to help the Handy Tab Extension communicate with you about offers from the Handy Tab Extension and our marketing partners. Such third parties do not have Handy Tab's permission to use your personally identifiable information for any secondary purpose. If you elect to use our referral service for informing a friend about any of our sites, we ask you for your friend's name and e-mail address. Handy Tab will automatically send the friend a one-time e-mail inviting them to visit the Handy Tab Extension. Handy Tab does not store the information related to your friends and the one-time e-mail sent pursuant to your input will be our only contact with that person for such input. If you contact Handy Tab, we may keep a record of that correspondence and we may collect your e-mail address. The Handy Tab Extension contain links to other sites on the Web. Please be aware that Handy Tab is not responsible for the privacy practices of such other sites. We encourage our users to be aware when they leave our site and to read the privacy statements of each and every Web site that collects personally identifiable information. This privacy statement applies solely to information collected by this Web site. Handy Tab Extension may use third party service providers to serve ads and e-mails on our behalf. 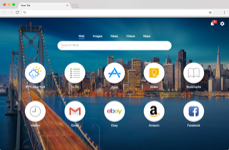 These companies may use technologies to measure the effectiveness of ads and e-mails and use information about your visits to the Handy Tab Extension so that we can provide a better search experience to you. For this purpose, we may also provide these third party service providers anonymous information about your site navigation. In the event Handy Tab goes through a business transition, such as a merger, being acquired by another company, or selling a portion of its assets, users' personal information will, in most instances, be part of the assets transferred.